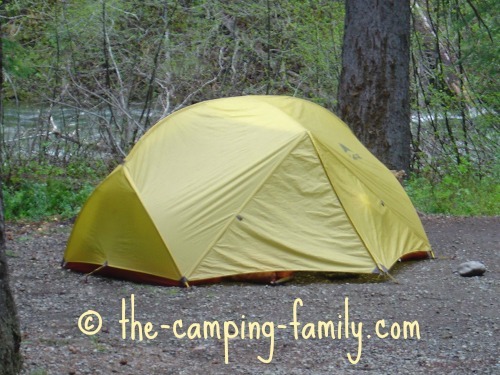 Choosing the right camping sleeping bags for your family is an important decision. There is nothing nicer than cuddling down inside your camping sleeping bags and getting ready for a good night's sleep. The right bag will give you a great sleep. The wrong bag can ruin not only one night's sleep, but an entire camping trip! There is a huge range of sleeping bag types available. Let me help you choose just the right ones for your family. 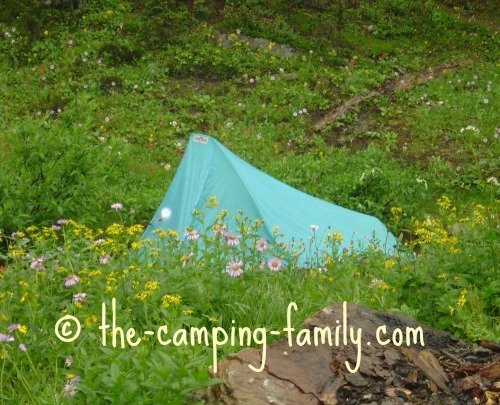 There are a number of factors to consider when you choose a camping sleeping bag. What kind of camping are you planning? 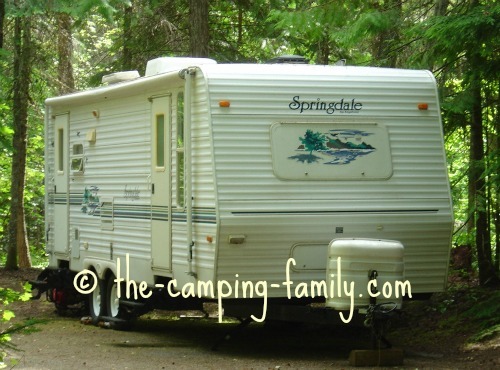 Will you be staying in an RV, a cabin or yurt, or in a tent? You'll need a warmer bag in a tent than in in an insulated and heated RV! Only in the heat of summer, or in the spring and fall (or even the winter) too? If you are planning to camp in both summer and winter, you may need more than one sleeping bag. A three-season bag will work for most of the year, but you'll want a warmer bag for winter. Here is some information about cold weather bags. In what geographic locations will you camp? In many places, nights can get chilly even in the middle of summer. Are you a warm sleeper or a cold sleeper? Once you have answered these questions, you'll have a general idea of how warm a bag you'll need. Most sleeping bags are rated for specific temperature ranges, but every company has its own system. Read this to understand sleeping bag ratings. Once you begin shopping for sleeping bags, you may become overwhelmed by the sheer number of options. Here's a quick rundown on the types of sleeping bags. Basically, sleeping bags are sorted by their material, their shape and their size. I love my down-filled sleeping bag. Down bags are the warmest, but they do have drawbacks. Read this to decide whether down filled sleeping bags are right for you. Synthetic sleeping bags are less expensive than down, and have a number of advantages for camping families. Here is some information about synthetic sleeping bags. I grew up sleeping in rectangular sleeping bags. They are versatile but bulky. 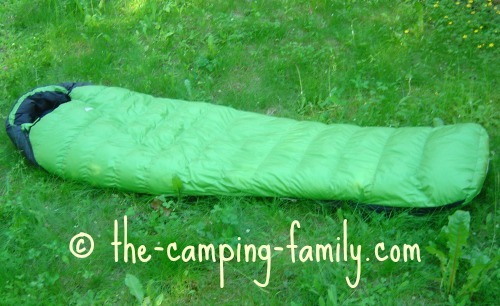 Here are some things to consider about rectangular sleeping bags. Mummy bags are the warmest shape option, but they have the disadvantage of making some people (like me!) feel claustrophobic. Here are some more things to know about mummy sleeping bags. A nice compromise between those two shapes is the barrel bag. Here's how to gauge whether barrel sleeping bags are right for you. There are bags for large adults, smaller adults, children and toddlers. 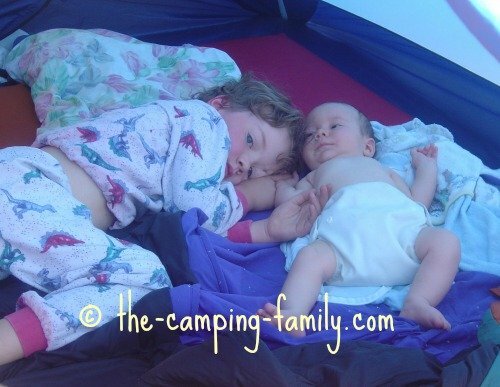 When we camped with our babies, we tucked them in with us. There are a couple of options if you choose to do this. You can get a double sleeping bag, or you can get sleeping bags that zip together. Before sleeping with your babies, be sure to learn about safe sleeping practices. Toddlers might be happy to sleep with their parents, or they might do better in their own little toddler sleeping bags. Older children will be ready for youth sleeping bags. 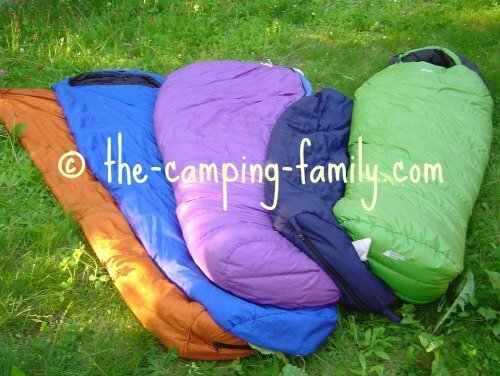 For more information about the different types of sleeping bags, click here. If you take good care of your sleeping bag, it will last for many years. You'll have to wash it occasionally. 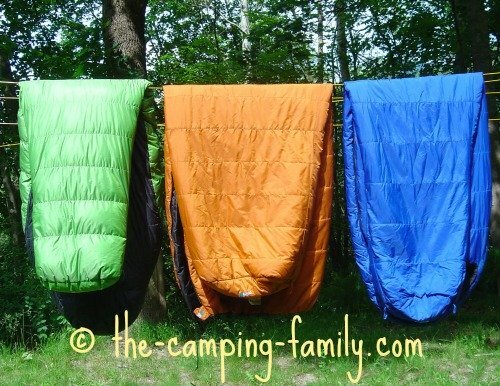 Washing a sleeping bag is easy - if you know how. Down sleeping bags need special care. 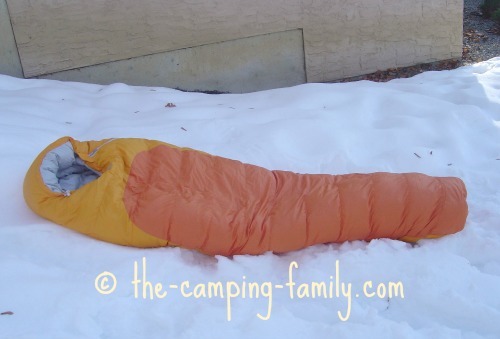 Click here to learn about down sleeping bag cleaning. If you use a sleeping bag liner, you can get away with washing your bag less frequently. Storing your bag correctly will also extend the life of your bag. Here's how to choose the best sleeping bag storage system for you. Many sleeping bags include extra features - everything from built-in loops for hanging to attached sleeves to accessory pockets. Some of those options are important, and some aren't. Here's my opinion about the various options, and some advice about choosing the best sleeping bag for you. Once you've chose the right camping sleeping bags, you'll also need a sleeping pad for each person. If you're a comfort-craving person like I am, you might also want to take along a camping pillow. Choosing the best sleeping bags takes time and thought, but once you have made your purchases you are set for many years of blissful sleep! Now that you know how to choose camping sleeping bags, go to The Camping Family home page for more camping guidance.